Week One of 2019 is done and with it, Week One of the Dogwood 52 Week Photography Challenge! The focus of the first week was “Storytelling: Self Portrait”; to take a picture that tells us who you are without actually showing your face. Now, I know what you may be thinking – particularly because I am willing to be a nickel you have a few selfies on your phone – that now showing your face contradicts the very idea of a self-portrait. Many might be inclined to agree with you. But let’s travel back in time to the age before the internet when singles adverts were placed in newspapers. Like Tinder but without pictures. How would you describe yourself? 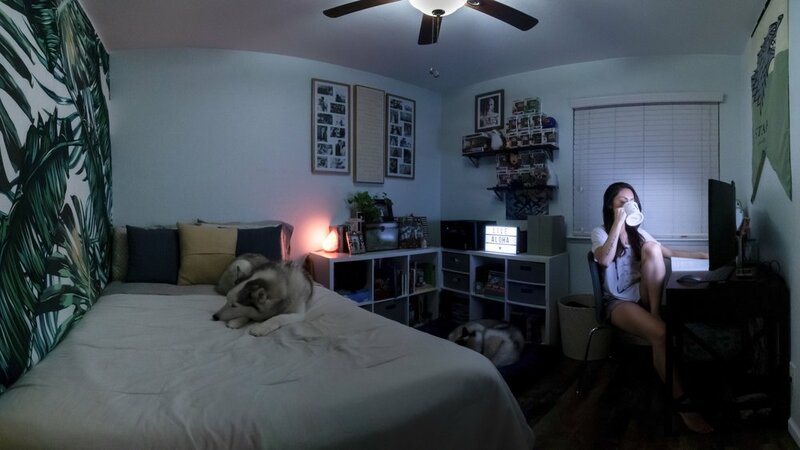 It was by asking myself this question that I came up with the idea to do a panorama of my room. To accomplish this, multiple photographs had to be taken and merged in editing. And my dogs had to stay still. Before this, the only panoramas I ever attempted were with my iPhone using the handy dandy corresponding setting already in camera. However, I could not be in the panorama without completely revealing my face up close if I went that route and honestly, I wouldn’t have had to learn anything new to do it. Sure, I could have used a wide-angle lens and taken a single shot on a timer but there again, I wouldn’t have challenged myself and even with my widest lens at 10mm, it still wasn’t enough to capture everything I wanted in-frame. I did give it a go. (2) I had been cleaning most of the day and needed a shower. I set the tripod up in the same place as I had it earlier in the day with the aid of some washi tape I place on the floor, set it to my desired manual settings, and connected my DSLR to my iPhone. 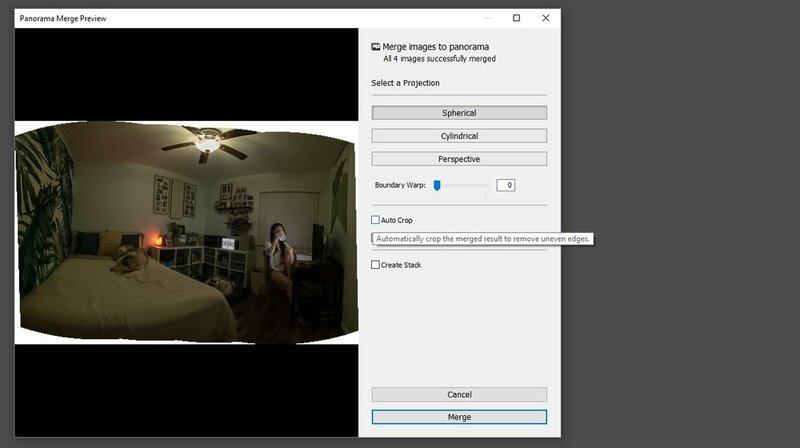 Using the CanonConnect app, I was able to remotely control my camera. When I was satisfied with the shot of me at my desk, I went behind the camera to line up the remaining shots. Because my dogs were in different spots, it was important for there to be only one pup in focus in as few frames as possible in case they woke up. I lucked out when Duke got up only to circle and go back into the exact same position in the same place since he was in the frame for my first shot. Shots on the SD card, it was time for Lightroom. Lightroom has a feature that merges the images of your panorama for you. Select the photos you want, go to “Photo”, scroll down to “Photo Merge”, and over to “Panorama”. Here’s where Malachi’s Pro-Tip comes back into play. 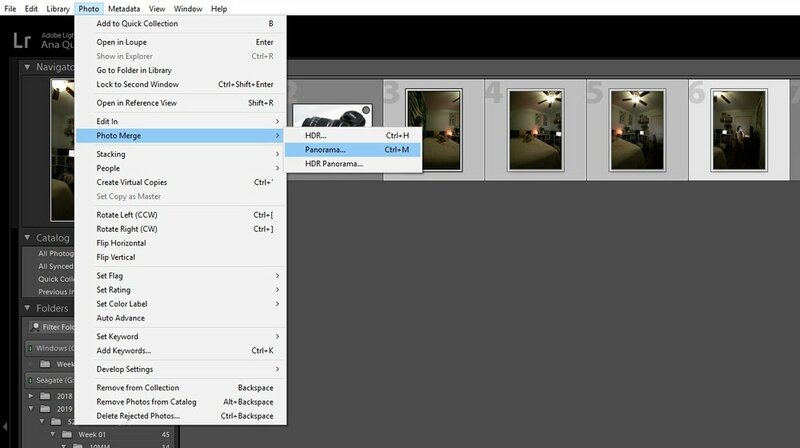 If “Auto Crop” is not checked, you’ll notice where Lightroom cuts out part of the images you’re merging so you want to give yourself a buffer around everything you want included or you run the risk of it getting cut out. Go ahead and check the box to auto crop. From here, get creative! Personally, because I wanted to play with the light sources in the frame, I referred to a Peter McKinnon video I had watched a few months prior in which he explains the Radial Brush Adjustment that you can watch for yourself by clicking HERE. I applied this tip to the light coming from my computer screen, my marquee sign (a Christmas gift from Malachi), and my Himalayan salt lamp. Aside from that, another quick search on YouTube led me to the PiXImperfect video on “How to Remove High ISO Noise in Lightroom” since the grainy look isn’t quite what I was going for. Overall, I am pleased with the final result and happy to have added a few new shooting and editing tidbits to my toolkit. This coming week, composition and the rule of thirds is king. From the panorama self-portrait, what can you deduce about me? Did you participate in Week One or will you be taking up the Dogwood 52 Week Photography Challenge in the second week? Let me know in the comments and drop your social media handles so I can show your photography projects some love on Instagram or Twitter! © 2019 Ana Quinata. All rights reserved.